It is snowpocalypse in Seattle. Snowmageddon. Snowmadness. Seattle is unaccustomed to snow. There are lots of hills, lots of small, two-wheel drive cars, and few snow plows. When it snows, the city shuts down. No one goes out. It becomes eerily quiet. However, this isn’t just a snow day. It’s projected to be a snow week. So, what do you do when the allure of Hygge turns into the angst of cabin fever? When you’ve streamed every true crime documentary and ate your way through all of the popcorn, and then all of the tortilla chips, what then? Today, I’m sharing 5 books that can take you out of your quickly-closing-in-around-you living room and out into the world. I’ve included a wide variety of genres, so, hopefully, there will be a cure for every strain of cabin fever! Author, and self-professed grump, Eric Weiner, traveled to the world’s happiest and unhappiest places investigating happiness. While Weiner identifies as grumpy, his writing is hilarious. On multiple occasions while reading, I made my husband stop whatever he was doing so I could read sections to him aloud, convinced that it was the funniest thing I’d ever read. The title may give off an essence of woo-woo, but this book is anything but. It’s practical, witty, sneakily educational, and a book I recommend to anyone who needs a good plane read, or just wants to feel as if they’ve vacationed. Find it on Amazon, here. This is Marie-Helene Bertino’s debut novel, and it is delightful. It follows three characters: nine year old aspiring jazz singer Madeleine, her 5th grade teacher (who’s looking for love! ), and the owner of the club, The Cat’s Pajamas, through one luminous, life-changing (of course!) evening. Everything about this novel is pure charm, but in a way that’s clever and not cloying. It’s Harriet the Spy, but for adults. I zipped right through this and was sad to leave it when I finished. During my senior year of high school, a wind storm hit my town. The winds were hurricane level. They ripped out trees and demolished sheds and barns and playgrounds. Afterwards, we were without power for five days. It was winter (of course), so I sat huddled next to our wood-burning stove and read Cold Mountain, Charles Frazier’s ode to Odysseus set just after the Civil War. Wrapped in blankets with the crackling fire, I felt as if I, too, was living in 1865. If you prefer to be a bit more “method” with your snow-day reading, this is the book for you. Find the book on Amazon, here. Growing up, Ella Enchanted was my jam. I read it over, and over, and over. A few years ago, I was cast in a reading of Ella Enchanted adapted by my friend, playwright Stephanie Neuerburg. (I built an outfit around her creative process. Read that here!) In preparation for our performance, I reread the book and fell in love with it all over again. While it’s intended for children, it’s just as transporting as an adult. If you love a good fairy tale with a feminist ending, and aren’t looking to try that hard, this is the snow-day read for you. Initially, I picked up this novel because the blurb implied that the story centered around a traveling Shakespeare troupe after the collapse of civilization. I assumed it would be about the power of theatre. I was sure that it would be particularly poignant set in an America where a flu has eradicated much of the population. It isn’t about the power of theatre. It’s about the power of people. The story interlaces multiple storylines in a time when humanity is nearly extinct. 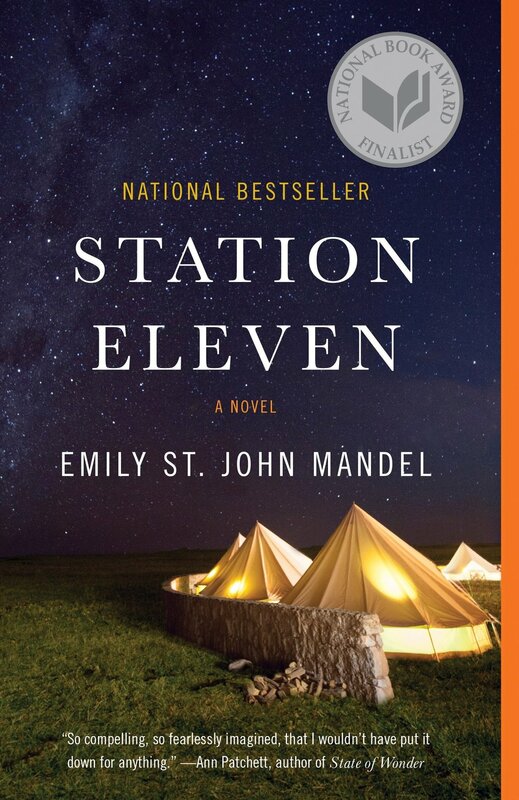 It’s a post-apocalyptic book that isn’t science fiction, and it raises questions about modern day society that left me thinking long after the last page. If you need an it-could-be-worse snow-day read, this is it. I’d be remiss not to mention the book that has inspired this month’s theme! If you’re committed to Hygge-ing all throughout the snowpocalypse, this book gives you plenty of tips and tricks. It’s easy to navigate and Meik Wiking’s tone is clear and charming. I particularly appreciated that he includes a whole section of Hygge itineraries for every season! Perhaps daydreaming of Summer Hygge is the cabin fever escape that you need! I’d love to hear your book recommendations, too. What books do you read to escape? What do you think I should read next? Now, I’m off to trounce around in the snow and pelt my husband with snowballs.